One of my daughters recently broke the news that she is engaged. She and the young man have been dating for a few years so it didn't come as a complete surprise. I am however, going to beg the indulgence of my blog readers. There is no doubt that information on wedding preparations will be mixed in with some of my reviews. We'll be hitting a lot of area bridal shops, flower shops and everything else related to weddings. If you've ever had to buy a prom gown in Knoxville you've probably been to David's Bridal. 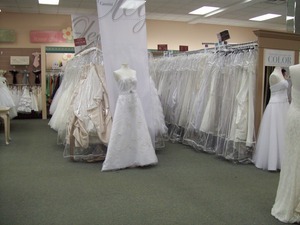 We've been there a few times for gown shopping for recitals, proms and bridesmaids dresses. Our experience has consistently been mixed. Even so, it's on our list again for possible gown purchases. Having such a selection available for internet viewing is a definite plus and we did find their alterations department to be a dream. These two reasons are drawing me back. Right now, we're in the process of looking for a venue for an engagement party. Where can you go in Knoxville for something that's a little different? We're looking at everything from Victor Ashe Park to other places. As a mom, I'm very excited for my daughter. She has found a nice young man and seems to have a shot at a happy life. There are going to be many good moments for us to celebrate together as she plans her Knoxville area wedding. It's the experiences that will stay with her for a lifetime. Moms always look forward to those special bonding moments. For me, those moments are special bridesmaids shopping trip to look for the gown and accessories. You know, that once-in-a-lifetime experience of having your girlfriends and mom with you as you prepare for the biggest day of your life. That's probably what I am most looking forward to for her. Travel from Knoxville to NYC, DC and Nashville top the list. Buying that big item for the wedding that she can pass down is going to be cool. Something is sure to catch her eye along the way. Perhaps it will be a depression-era mirror or other item along that line? Whatever it is, I know she'll value it so that she can point to her children and say "this is from my wedding". All of this pales when compared to her happiness. As a mom, these three portions of the process are the most exciting but no doubt, lots of other great memories will be made. We'll get to visit all the Knoxville florists together and choose and address all those neat little invitation packets. Future mom-in-law will be busy with her son's activities but hopefully she'll want to be involved some in the bridal planning. If she wants to be involved in some way, (even though the wedding is the bride's deal) I'm confident that my daughter will want to honor that. Future mother-in-law is a lovely person. The whole family is very nice. Look for lots of reviews on Knoxville businesses and wedding travel information as we go along. It's sure to be a fun year. There are many fun places for engagement parties in Knoxville, including Lakeside Tavern, Concord Park, World's Fair Park, Enchanted Details Wedding Boutique (they rent their space and you can cater anything you want), Cru Bistro and wine bar in Turkey Creek, Irish Times, Crowne & Goose, Aubrey's, Downtown Grill and Brewery, and Cafe 4 ( I think they rent out the Square Room space). I am with JoPhoto, a wedding photographer in Knoxville. We are the recommended photographer for Alfred Angelo Bridal. Did you visit Alfred Angelo last weekend while dress shopping? Not yet but its on the list. We're slowly working our way out to West Knoxville. Thanks making the suggestions. I'm definitely going to look into some of them (starting today in fact).